Dr. Donna Friess - Donna L. Friess, Ph.D.
Donna is enjoying writing books, painting, and leading tours at the San Juan Capistrano Mission! 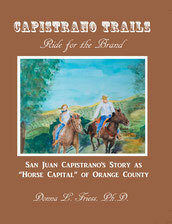 Capistrano Trails Hardbound Edition is now available! Now available on Amazon.com in b&w softcover and Kindle editions!